Bang the Drum Slowly is one of those rare plays that will appeal to a wide range. (Ahem: pardon me while I make sweeping and offensive generalizations.) Men will appreciate the references to baseball, teamwork and perseverance while women (and gays) will respond to the themes of friendship, loyalty and men in towels. It also helps that Raven Theatre’s production, under Michael Menendian’s direction, is pretty much a home run. 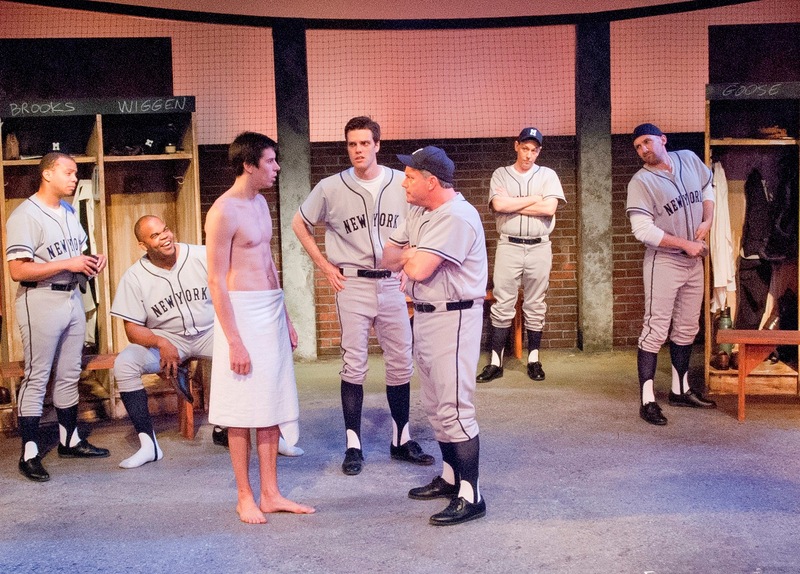 Eric Simonson’s play, based on the book of the same name by Mark Harris, tells the story of a 1950s baseball season with the New York Mammoths (a fictional team based on the New York Yankees). The ramshackle group struggles to make the season a winner, but little do they know that gangly country boy Bruce Pearson, the team’s catcher, is harboring a devastating secret. He’s been diagnosed with Hodgkin’s Disease, and the only person he confides in is star pitcher Henry “Author” Wiggen (Michael Stegall, showing off his All-American Colgate smile at every opportunity). A fiercely loyal friend, Wiggen keeps the secret close to his vest and also looks out for his buddy by negotiating a clause in his contract that states if Wiggen goes, Pearson goes, and vice versa. As Pearson, Kevin Duvall conveys simple charm and earnest sincerity. You wonder how he even made it on the team in the first place as his talent seems more around perfecting an “aww shucks” demeanor than anything concerning a baseball. But that makes you root harder for him. Simonson’s script isn’t revelatory or even remarkable. It’s simply a straightforward story of a group of guys looking out for each other and rallying together when times get tough. The ending does feel a bit pat, leaving you wishing for a bit more insight into the smooth-talking Wiggen. We never seem to get past his American hero veneer. In fact, the only character who undergoes any notable evolution over the course of the play is “old timer” team member “Goose” Williams (Joshua J. Volkers) who reveals a compassionate side under the blowhard exterior. Otherwise, everyone else in this 15 person testosterone-heavy cast seems rattled for a scene or two, but quickly moves on after the inevitable strikes. I guess there’s no crying in baseball. But Raven’s crowd-pleasing production is first-rate and a perfect summer date-night show.